If you’re a fan of Jason Statham action films, you’ll be happy to know his latest movie, a remake of The Mechanic, opens this weekend. 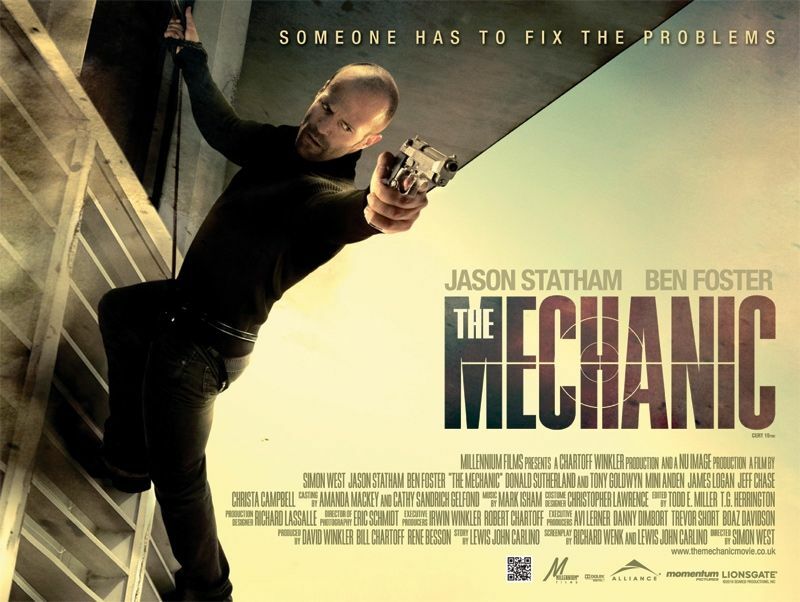 Like the 1972 Charles Bronson film that it’s based on, Statham plays a ‘mechanic’, which is “an elite assassin with a strict code and unique talent for cleanly eliminating targets.” Unlike some remakes that stray far from the original, Statham’s remake uses the same plot, but updates all the technology and kills. Also, Simon West directed (Con Air, Lara Croft: Tomb Raider) the film so the action is well done. I actually thought the remake was a lot of fun and casting Ben Foster to play the apprentice was a smart move as he’s a very talented actor that brings a lot to the role. For more on the film, watch 4 clips here. If you’d like to listen to the audio of the interview, click here. Otherwise, I’ve posted the entire transcript below. The Mechanic opens January 28. Jason Statham: Hello there. What’s going on? Question: How you doing? So do you enjoy doing this kind of press, room to room? Statham: Well I’ve got to be a good actor and say “yes, I love it”. Some actors say that they do the acting for free and they get paid to do the promotion. Statham: I can see where the inspiration for that saying is. But, you know – we have to do it don’t we. Well how did you like this role, as I’ve spoken to you before about kind of the evolution of your screen tough guy, kind of, usually outside the law kind of guy, and you know, The Bank Job was sort of different from a lot of movies you usually make, this seemed to have more interesting character stuff going on, more interpersonal relationships than before, where do you see this on your path of character evolutions? Statham: I think it’s moving in a direction that I want to be moving in. It’s a little more interesting to play this kind of a character than some of the other roles that I’ve done. And I’m getting to work with more experienced producers and more experienced directors, and you know, people like Ben Foster, working with someone of that quality. I think everything just, once you get a good screenplay, it starts… everything sort of comes in to effect with having a good screenplay. You get good producers… Everything gets raised in some way and I think that’s the driving force, for me to work with better people doing better things, and having better scripts and I think this is certainly something that I can say is going in the right direction. I’m curious about the way you get ready for a role. How do you get ready for it? Do you do prep work 2 months and out or are you going to the gym more? Can you sort of, talk about your regiment? Statham: It changes so much, depending on how injured I am. It depends on what kind of action they want from it. Usually I’m trying to work with people that I’ve worked with before, so we have a certain amount of know-how and what we’re going to do together. But it wasn’t like we had a ton of, you know, extensive choreography to learn, but I always have a gym that I always go to that preps me. And I work with a ton of stunt men there. It has the environment, it’s a place called 87-11 up near LA-X and there’s a ton of stuntmen working out all the time and it’s great to go there before I go shoot a film. But in terms of you know, dieting and losing weight… I try not to focus too much on that unless it’s really really necessary. But my routines, my prep before a movie changes so much yeah. You talked about how your goal is to work with better people and work in better productions, and you know, everything getting better. I’m just curious, how have you evolved over the last ten years? Are you more comfortable in your shoes now as an actor? 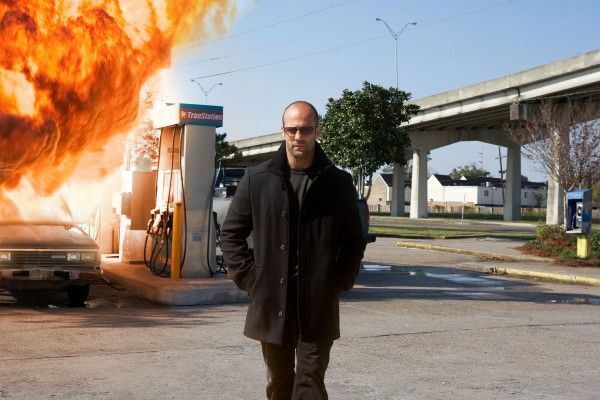 Statham: Yeah, I think I know what I’m doing: just! You get to know what you’re doing. And there’s no substitute for the experience, and you know, the more you do the better you get. The more you understand what you need to do. A lot of the elements are not in your control and when it all comes together in a good way then it’s all good. I mean, for me, to be now working opposite Robert De Niro and Clive Owen, you know that’s definitely a step in the right direction I feel. Have you started on that? Statham: Have I started on it? We finished it. Yeah, almost at the end of the first directors edit. His first cut we’ll be seeing soon. So how was it? Was it intimidating? Statham: I don’t know. Working with De Niro is very intimidating yeah, as you can only imagine. You don’t want to make a fool of yourself in front of that man! So is that a remake of the Peckinpah film? Statham: It’s not no. I’m not sure if that’ll be the finished title. So there’s no theme questioned for 70s tough guy movies? I’m curious – I mentioned a second a go about the way you get ready for a movie. Your going to act, well you acted opposite Clive and De Niro, how did you get ready for that one maybe differently than from some of your other projects? Statham: Well are you talking about physical prep or? Statham: Well I’m not a method actor, I hope you know that! (laughs) You don’t have me working for the SAS soldiers, you know. I find an ability to be able to play the roles that I do. Of course, that wasn’t where I was going. Statham: Ok. In terms of the physical stuff, you know, it’s just about being available to the choreography and the locations and the stunts that are required. So the prep, there’s a certain style that you might need. There’s a certain aspect that we address in terms of the fighting style. And that’s just about what the character did and what kind of a background he comes from so…the physical stuff is easy. The other prep comes from rehearsals and communication with the director, and that all comes when you get to wherever you are filming. Are you comfortable with your image of sort of, the true action man of your generation? Statham: Very comfortable I suppose! If that’s what you want to call me. You know, I’m just working away and I’m very happy doing what I’m doing and you know, things have been going well recently. I’ve been working with some good people. Well Stallone basically told me that when he thought of who he would cast, as your guy in The Expendables, someone that age, you were the only person he could think of – that you’re it for this kind of thing that, you know, had so many multiple people trying to do it back in the 80s and such. How did that happen? Culturally, or with you individually or what? Statham: I don’t know. We just ended up doing a couple of films with Luc Besson, and we did a couple of other movies that Sly liked. Who knows what runs through a director’s head, and whether you’re right for the part. A lot of the other people he might have called were doing other things so, I don’t know, maybe I was down on the list. I think you’re underplaying it. Have you heard about a sequel to The Expendables? Statham: Yes I have heard about a sequel and I’d be the first to say yes to a phone call from Sly. I mean, we spoke about it as soon as the movie started to do really well and he says, you know, it would be great to do this again, and if there’s anyone who can do a good sequel it’s Sly Stallone! He’s done a fair amount. Yeah, we had a good time. It’s something I’d like to repeat. Speaking of Sly, he’s been in the business for so long now, and this is a remake of a movie from the early 70s and I just wonder, did you get any inspiration from movies made in that time for yourself, did you grow up with them in any way and…? Statham: Yeah, I watched a lot of movies over my time. Do they influence me? Statham: Of course, I’ve seen every film they’ve all done. Yeah, that’s why they’re so great you know? They do films that you can watch time and time again. I’ve always been a fan of Bronson and Stallone. Was there any hesitancy about tackling a classic Charles Bronson character or was it kind of exciting? Statham: It’s always, you know, the comparisons that are going to be made, and you know, it’s not the first remake that I’ve done. We did a remake of The Italian Job years ago, and that was such a great classic movie that some people would think should never be touched. But you know, the movie ended up really, you know…. It was really a very decent job. It’s the same with this. There are a lot of people who won’t remember the original or won’t even have seen it. There’s a whole generation. It was almost 30 years ago. Yeah, I don’t think we’re too bothered about it. I was wondering, since you seem to make a lot of action films, what type of films do you like to watch when you go to the movie theatre? Are you more of a romantic movie type of guy or…? Statham: I like all kinds of films. He says through gritted teeth! Statham: [laughs] I don’t have any particular favorites. No, you know, I enjoy myself. When I go to the cinema I watch all different kinds of films. Well what have you seen recently? Statham: What did I see recently? Last movie I went to see? I saw The Fighter, I saw The King’s Speech. And what did you think of those two? Statham: I thought they were terrific, both of them. Very good indeed. I’m a big fan of your pairings with Neveldine/Taylor, I’m curious, when you think of the Crank movies, what’s the first thing that comes to your head and do you ever think there’ll be a third? Statham: It’s a shame the last one didn’t do that well. I think the first one had a little bit more success and usually if you do a sequel, it usually has to in some ways take a little bit more money than the first one. Well the second one is just balls up crazy. Statham: Yeah, it was absolutely nuts, which reflects exactly who those two are. I don’t know, whether we’ll do another one? Who knows? I just know we had a great…working with those two guys is not like working with anybody else. I mean, they are absolutely mad as hatters. And Neveldine, moved to the country not so long ago, and has been living a different kind of life. I don’t know how plugged in he is to doing a third one. Well they’re directing Ghost Rider 2 right now, so they’re clearly back in the game. Statham: We’re always in touch. We always mention the idea of, shall we do another one, I don’t know. Why do you think movies about hitmen continue to be so popular with audiences, and something they want to see? Statham: I don’t know. Maybe you can answer that better than me. I don’t know, I was just getting your opinion on it. Statham: I have no idea. Well why do you think they always have such nice houses in the movies? Statham: Very lucrative job, huh? What else have you got coming up? There’s a title called Safe? Statham: Yeah, I did a movie with Boaz Yakin and Lawrence Bender produced it. 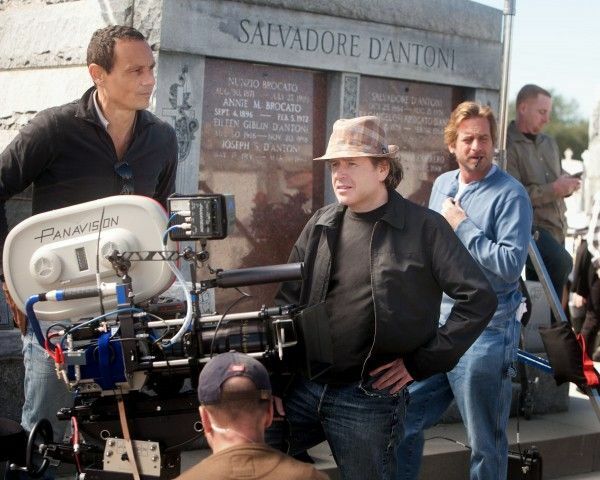 Movie called Safe that we’ve just finished in New York. Statham: I don’t know if I should tell you about it really. I was here to talk about The Mechanic. I mean, it’s an action film, as you can probably gather. Are you a hitman in it? Statham: I’m not a hitman no, not this time around. But we’ll do all the press with that I’m sure, soon enough. So apart from making action films what do you like to do in your free time and training and stuff like that? Statham: I like to relax. Spend it with people that I’ve grown up with, or people that I care about, and you know, just relax, sit around doing nothing or sitting on a beach. Are you in to soccer at all? Statham: Not so much. All my friends are. I’m not as big a soccer fan as people might imagine, being British. I wanted to know if you could talk about working with Luc Besson. You’ve obviously had a great relationship with him. Could you sort of talk about the dynamic between the two of you and how it works when you’re filming? Statham: Yeah, I met Luc years ago and again, he’s one of the key figures in my career and you know, he was basically the person that gave me a shot at being, at playing the lead in a movie. If it wasn’t for him, the action movies, I don’t think would have had the same effect on my career so, yeah. He is a very significant man and I remember way back, we had a bite to eat in Paris, and the next thing you know he’d written a script in a few weeks. He’s famous for that. I mean, he churns out scripts faster than anybody. Do you have any input in that kind of stuff or…? Statham: No, there’s no time to have any input, it’s done in three weeks and there’s the script! He’s so involved, and I remember some of the rehearsals that we did, you know, he tends to find kids at a film school and he’ll use them and sort of… He’ll write the script and he’ll have them come in and sit in and he’ll basically orchestrate the rehearsals and show exactly what the shot should be and then send them away and then, you know, they’re almost like puppets, basically do exactly what he wants them to do. And he’s just a master of it. He can just find people in the street, turn them in to actors and actresses. He’s got an amazing talent in finding people. Are you having conversations with him for maybe, some future stuff? Statham: I bumped in to him when we were doing some press on The Expendables and we spoke about maybe doing something in the future yeah. Ben [Foster] just told us how you messed up his shoulder during shooting the fight scene stuff, anything happen to you, you know, any of the stunts you did challenge you? Statham: I was injury free on this one. Normally I get beaten up and I end up doing something that needs a bit of time to heal, but this time I was pretty good. Did you do anything that you didn’t do before, that really pushed your buttons? Statham: Not on this one no, this was an easy gig for me in terms of the action. You’re not in to soccer, do you follow competitive diving at all? Statham: No, it’s probably the smallest sport in the world! I don’t know if it’s even followable or not? Statham: No it’s not even followable no! Literally as soon as I retired from diving I had no interest in it. So how did you start getting involved in diving? Was it something that you liked and that’s how you started it? Statham: I tried it, and you know, within a year I was on the British team and all of a sudden, you know, you’re traveling all around the world competing and there’s a certain aspect of that that’s very appealing to a young man. You know, the competitive element and traveling internationally with the British squad, there’s a lot of fun in that. Next thing you know, click your fingers, turn around and 12 years have gone. It’s just one of those things. It looks like a very demanding sport now. Statham: It was very good for me to do what I’m doing now, because a lot of the training is all sort of, pointed in a direction that, you know, allows you to gain aerial awareness, so if you’re doing a lot of the stunts, you have a very great sense of distance and timing. And you know, a lot of the tumbling that I used to do, and trampolining, it’s paid dividends in so many ways doing all the stunts. And it’s definitely a large portion of my early physical life. It’s definitely paid off. With so many roles and physical stunts under your belt, were you able to give your girlfriend Rosie any tips for shooting Transformers 3? Statham: We’re not asking about Rosie. Your character in this movie is a big car enthusiast, is it something you’re interested in? Statham: I love cars actually, yes. We could talk all day about vintage cars, yes. So it must have hurt to see that beautiful vintage car blow up. Statham: I’m not sure what they did, but I’m sure they just made a shell that was very cheap and the same color, but yeah, the old E-type is a great car. Do you have any cool cars? You don’t like tinkering around with them? Statham: No, I’m not much of a tinkerer, no. I just like the design and the materials that they use. I’m particularly fond of all the Jags, the old Austin Martins, the British cars. How far out do you plan for your career? I mean, are you thinking already, I’ve got films lined up all in 2011, you know, I’ve got four things, or are you sort of like, I take one project at a time and that’s as far as I’m going to look? Statham: Sometimes you can get kind of chopped up with it. This is the first period in several years now that for the next few months I’m not doing anything. Normally come January the last three years, I’ve always had something in front of me. The trouble is, once you sign on to do a movie, there’s always an aspect of that, that you might miss something else, so.. The most I’ve had is a couple of movies in front of me, but now I’m just waiting for Stallone’s next film, The Expendables . Statham: It’s more than likely yeah. I’m very positive that it will be going. Oh, so this is what you’re waiting on. Ben Foster was mentioning before that to make movies for him sometimes it makes him a better person, or learn a bit more about himself, is it also helpful to you to make movies? Have you learned more about yourself over the years or…? Statham: Not personally no. I enjoy making movies, that’s a guarantee. I mean he’s… Ben’s a lot different to me. And I think that’s what makes this pairing so good in the movie. He’s a very different person indeed. That’s what makes the world go around. Was there a particular scene in The Mechanic, while you were shooting it where you just kind of thought: this is great, this is why I make movies, this is so much fun? Statham: I think just being strung up there with Ben, to see how scared he was when we was doing the down the side. It makes me sound a little bit sadistic there, but yeah. It’s great when you do something good and everyone… there’s a great excitement to… it seems that a lot of the action is always so much more rewarding doing something in terms of the action than, you know, you do a good dramatic scene, there’s no-one clapping for that. Apart from, you know, people might get touched by it, but the actual immediate reward, if you do a good stunt and it works out well, there’s a great euphoria on set. And that just doesn’t happen in dramatical scenes. A lot of people just don’t get that immediate reward. Statham: It was quite fun yeah, he was pooping himself. And how was it shooting in New Orleans? Statham: We had a great time down there. We met some good people and made some great friends. It’s the second film I’ve done down there. It’s slightly more appealing in the winter time than it is in the summer. It gets kind of sticky.